We travelled to Sierra Maestra and overnighted in a chalet complex. 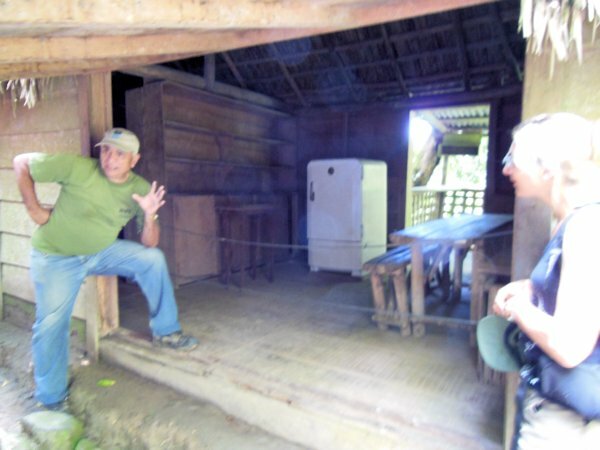 In the morning, we trekked to Castro’s hideout in the mountains (we drove up an enormous hill in 4×4’s to a car park). From here it was about 2.5 hours walk. There were lots of huts where cooking and first aid were done. Our guide pointed out that they try to make it as authentic as possible, but the buildings rot every 15 years, so the ones were looking at are replicas. We get to see Castro’s own accommodation (it was a simple shack with 2 rooms). It had a kind of “trick” entrance to trap people (a bit like one of those ninja houses with trapdoors and stuff). In reality, I thought it was a bit silly. If someone got into the compound would they really tip toe up the steps like some character from Scooby Doo, or more likely just fire an rpg or heavy machine gun into the building from 50 metres away !. 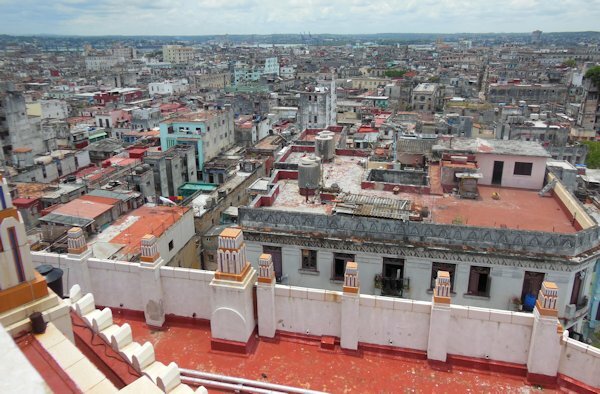 Castro’s 1 luxury, was a fridge (which was gas powered, as there was no electricity). From here we travelled on to a place called Sanncti Spiritus (which to me seemed the wrong way around, but its their country, so what the hey). I love to see innovation at work. Transistor radios and the simple pleasure of listening to music, can’t be underestimated in Cuba. For this reason, someone some had setup this “table & chair” business on the pavement. I wish I could have hung around and found out what kind of person it was. As we continued wandering around the town with the back-to-front name, we came upon this. The oldest bridge in Cuba, which spans the Yayabo river. 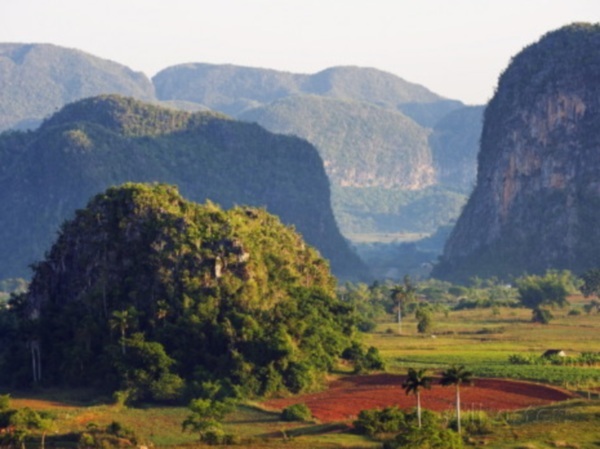 Not widely known, but as well as the Spaniards, the British (referred to locally as the English) colonised Cuba for about 6 months. 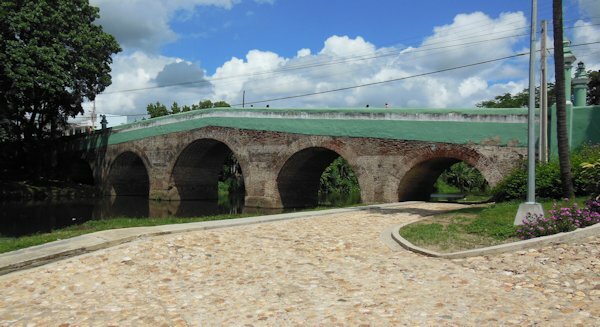 It was during this time that they built this rather iconic bridge. After 90 mins of baking heat and cheese sandwiches I never wished to see again, were back on our coach headed for Santa Clara. It’s famous as the turning point of the war, when Che Gavara attacked an armoured train with a bull dozer and captured all the soldiers and weapons there in. Realising re-enforcements weren’t coming, it was just a few hours, before Batista and all his crony’s were hopping onto planes with suitcases filled with US Dollars (well, that’s what local propaganda will tell you). Che Gavara was originally from Argentina and a Dr by profession. 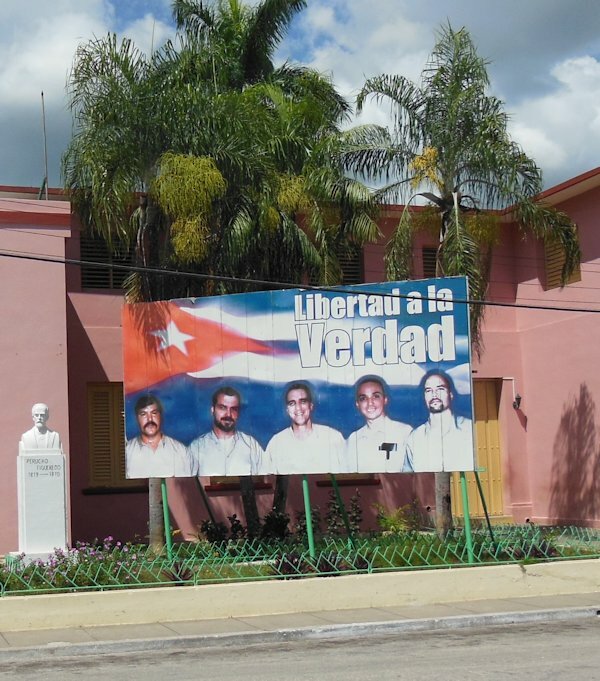 He was given honorary Cuban nationality and after the war helped “rebuild the economy”. Later he travelled around helping out with other revolutions all over South America. It was here, that he was captured, and later executed on the orders of the CIA (highly probably, but again, propaganda). His remains were found some years later and returned to Cuba where they now reside in his museum and mausoleum. Freedom fighter or international trouble-causer. Whichever you think, he cut a romantic dash, and the museum has many fascinating artefacts inside (which sadly you aren’t allowed to photograph). On top of the building is a giant statue of him, which really seems to capture his courageous/devil may care persona. 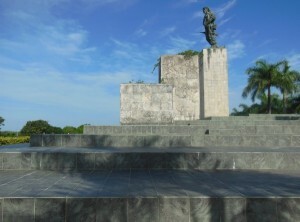 He was revered by most of the Cubans that I met. Staying in Santa Clara, we visit a museum dedicated to the Battle of Santa Clara. 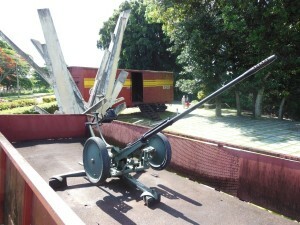 Its made up of the armoured trains, originally captured during the battle. Each of 5 carriages has pictures and artefacts, retelling the story. They even had the original bulldozer used to derail the train. Posters like this are common all over Cuba. Usually positioned in front of key tourist sights, the idea is that you photograph them unwittingly and when you show them to your friends, they spread the word. Cuban: Terrorists based in Florida bombed hotels in Havana, in order to hurt the Cuban economy and later bombed a plane with the Cuban fencing team on-board. Castro’s WASP network of operatives were activated and sent to find the people responsible (it being reasoned they would have more success than white FBI agents, who it’s said they were working with). Once the terrorists had been captured, the FBI “turned coat” and arrested their “allies” as spies and they received lengthy prison sentences (3 remain in prison today). American: There were enemy spies operating in our country working against American interest. When we caught them, they went to gaol. It’s controversial (just try googling it) but it won’t go away, and the Cubans still argue passionately for the return of their countrymen. Not much I can say about this, except it was lovely countryside, and some amazing “sugar loaf” mountains. We had a morning tour, with a guide with a very strong American accent, who kept insisting on telling jokes. We only seemed to wonder through fields and stuff, and didn’t get into the mountains I could see high up all around me. Overall, a bit disappointing. In the evening we had run low on local currency, so had dinner in the “expensive” hotel restaurant (which we realised was a 3rd of the price of the Paladare !). 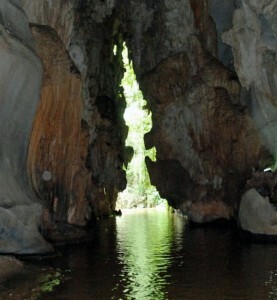 In the morning, we went for a boat ride through some caves. Our captain used a laser pointer to highlight naturally occurring rocks, that looked like elephants and stuff like that. I found the overall rock formation far more interesting. Saw a sign for cheese sandwiches. 1.2 cuks. I had been paying between 4 and 6. More rip. Next day, we drove to the coast, then got a boat out to the island of Cayo Levisa. A cliché I know, but this really was a tropical paradise. We were still low on local currency, so we couldn’t pay for canoeing or anything. Since the trip had been so long and arduous, I simply got on a sun lounger in the shade and slept for about 4 ours. I was well overdue a rest. Back home on the ferry, and a 2nd night in Venales. Next Stop Havana. We arrive back in Havana. 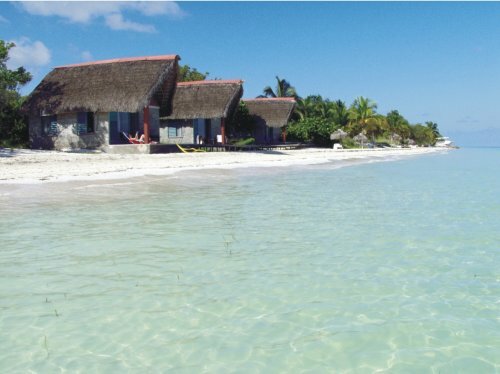 We’d decided to stay 2 extra days after the trip to relax and chose a Casa, owned by a local Dr, which he shared with his wife and his housekeeper. The accommodation was simple, but more than adequate. 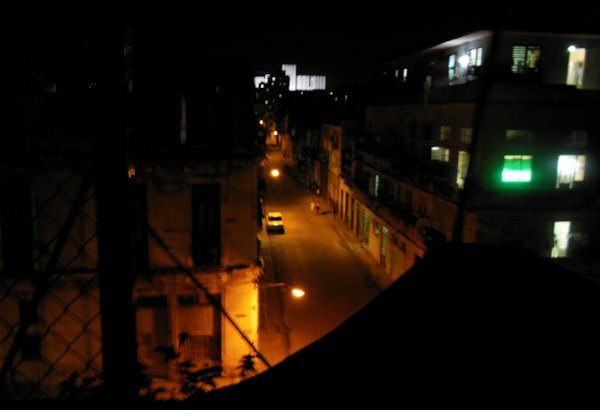 We were actually living in a normal Cuban house. Returning home from an evening out, I was initially a bit nervous, but needn’t have been. These people have nothing, but are mostly happy and perfectly law abiding. It featured a rooftop garden, and both evenings we had an hour up there to unwind. On a previous visit, the museum of the revolution had been closed, so we were delighted to head back there and find it open. Its based in a building, that was previously Batista’s palace and outside a piece of mobile artillery (which many people mistakenly called a tank) is located. 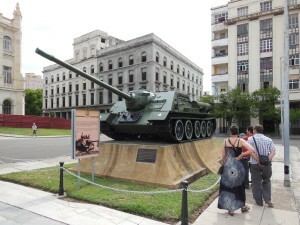 A sign next to it states that it was Fidel Castro who personally fired on (and hit) an American warship from this vehicle during the Bay of Pigs. How true that is, I dont know. Inside they had offensive murals to American presidents, models of Che Gavara and a whole host of pictures and memorabilia from the war. One awful thing, was the display above. 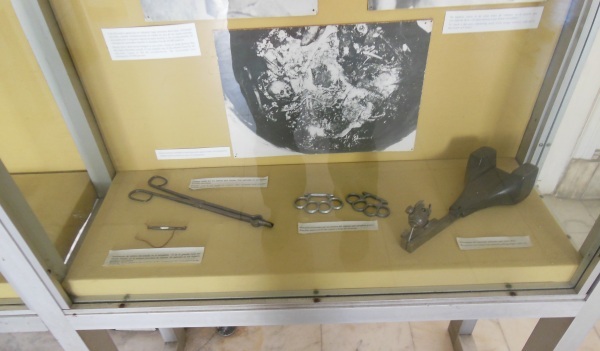 Used by Batista’s forces during interrogation, the “scissor” thing on the left were pliers and used on the private parts of those being interviewed. 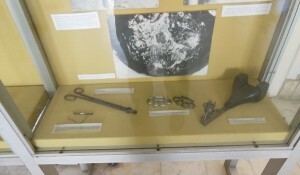 The delightful thing on the right, a device for removing finger nails. 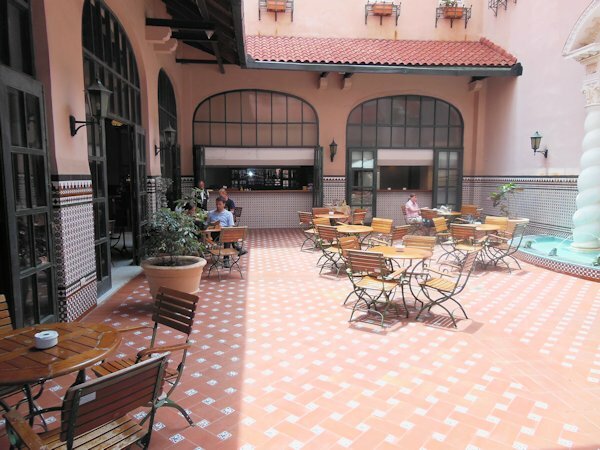 Most people associate Sloppy Joe’s bar with the Alec Guinness film Our Man in Havana. A bit touristy for my liking. 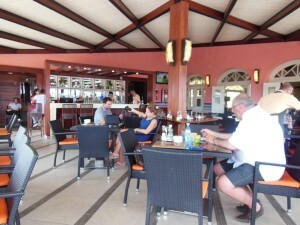 Lesser known, and a far more relaxing and desirable location is the bar in the Seville hotel. A lovely venue with some fine music. 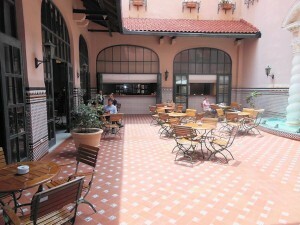 The outside bar in the middle of this picture, is the one (albeit re-decorated a few times since) featured in the film. We carry on exploring around. 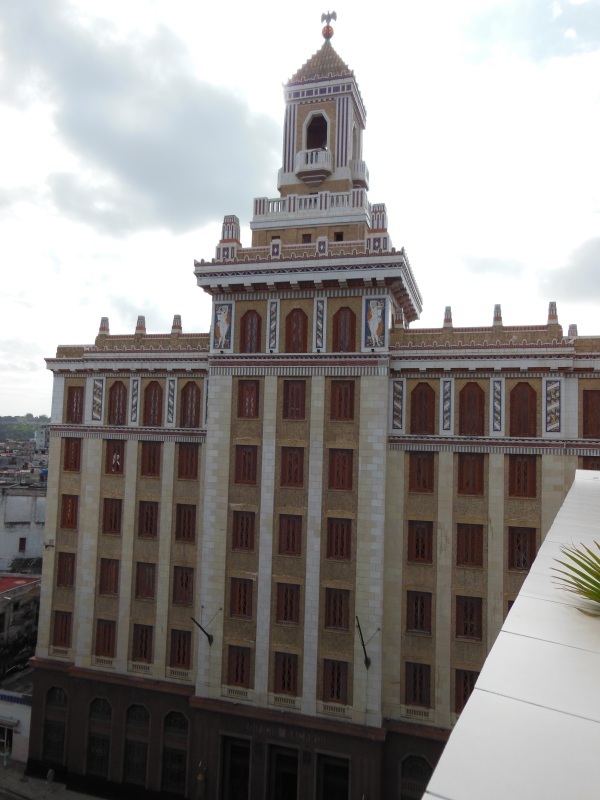 From our hotel, we’d seen the Bacardi building. What I didn’t realise, walking past it, on our way back from the Museum of the Revolution, is that you could go inside. No, not an organised tour, the security guard, flagged you down and said he’d let you in for 2 cooks. Above is a photo of the foyer. He allowed us to go up in the lift on our own. The building inside was literally crumbling, but from the top, I got this spectacular shot of the rooftops of Havana. 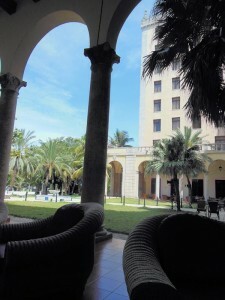 A place my friend Dan had talked about many times, was the famous hotel Nacional (Dan had stayed there, previously). Built in 1930 by the Mafia, it hosted a Mafia summit in 1946 which was dramatised in the Godfather Part II. 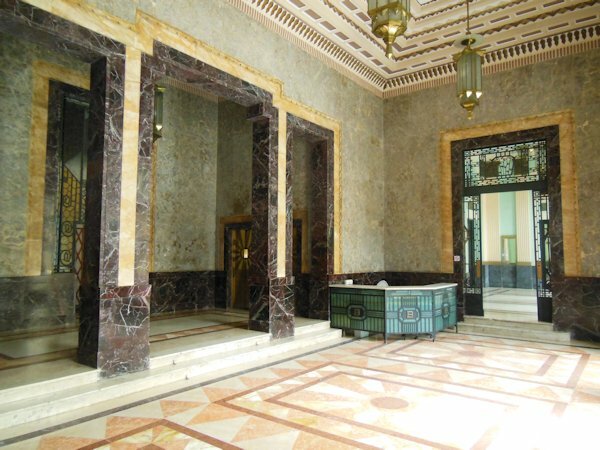 The hotel foyer was spectacular. We wandered through and found a spot in the garden, where we relaxed in the shade. Mohito and Crystal. And since its lunchtime, 2 cheese sandwiches. The nicest thing I ate on the whole trip. The whole place is fab, and filled with the splendour of a bygone era. The only thing that was tacky, was a sort of museum of people who’d stayed there. It was just sections of the wall with pictures of people (and not particularly taken in the hotel ether, so hardly authentic). But there was something far more fascinating to see. 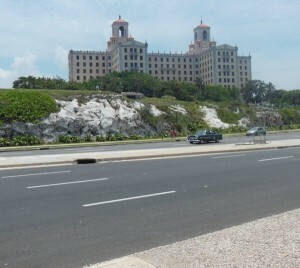 Just like the Bacardi building, not featured in any guidebook. During the Cuban Missile Crisis. 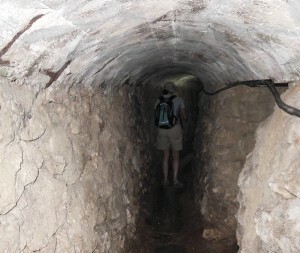 Tunnels were dug underneath the garden in anticipation of an invasion. We were able to wander around in them. Its time to head back. The heat of the afternoon and several Cristal’s have made me tired. We travel home in a potatoes taxi, sometimes called a tuk tuk, which it technically is not. I like this shot, as it shows a cyclo, a potato taxi and a Chinese coach. All the types of transport we’d used on a trip (well, with the exception of the KLM plane, that flew us in). 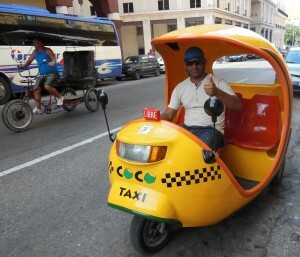 The potato taxi uses recycled vegetable oil as fuel. Reminded me of a documentary I’d watched on the coach. It talked about 1991 when Cuba was in financial crisis. The Russians weren’t trading oil for sugar, and the country had to think of something quick (which they did). The converted the cars to run on diesel. Promoted cyclo’s and bicycle’s. Created the potato taxi’s and most fascinating, ran power stations, by burning sugar. The American woman in the documentary said it was a superb case study for peak oil. 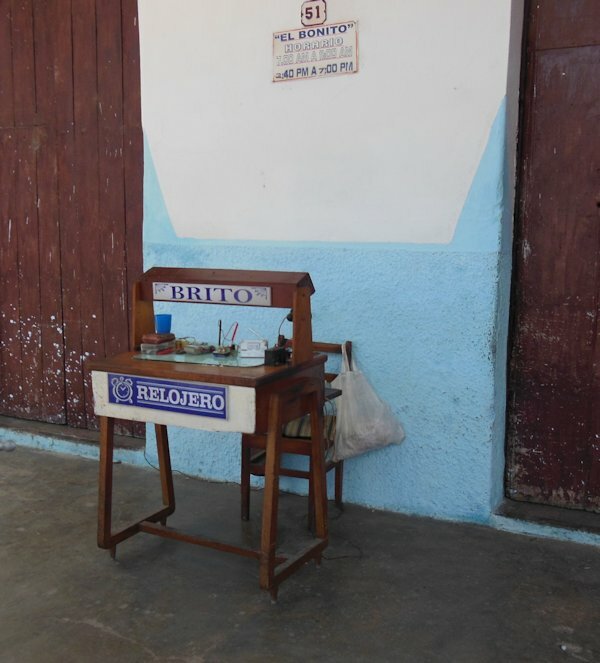 One day supplies will be limited not matter how much money you have, and the Cuban solution is one we should all pay attention too. On our Final afternoon/evening we decided to visit Ambos Mundas. Most people know about it, as its the place where Earnest Hemingway lived for 7 years (they even have his room available on show for tourists). We weren’t that bothered, having previously visit a bar “where Hemingway used to hang out” and finding it to be awful. Instead we headed for the rooftop bar, and just relaxed. An amazing trip overall, and an absolute roller coaster. I think I saw and experienced practically everything you can cram into a 2 week trip. I was exhausted, and it would be another week at home in the UK before I’d fully recovered. But that’s adventure. If you want to lie in bed, holiday in Ibiza, and don’t get in anyone else’s way.